Age group specific playground structures like the Buckaroo, foster the development of mental, physical and social skills while generating feelings of confidence and empowerment. Safe, modern and strong the Buckaroo is constructed with eco-friendly conditioned wood or 100% recycled plastic and metal, which is great for parks, daycares, pre-schools and churches. Designed for children of all abilities between 2 and 5 years of age, this comprehensive structure is equipped to create hours of fun play. Children can play independently, with a friend in a group while they climb the Play Shells or race down the Solo or Duo Chute Slide. 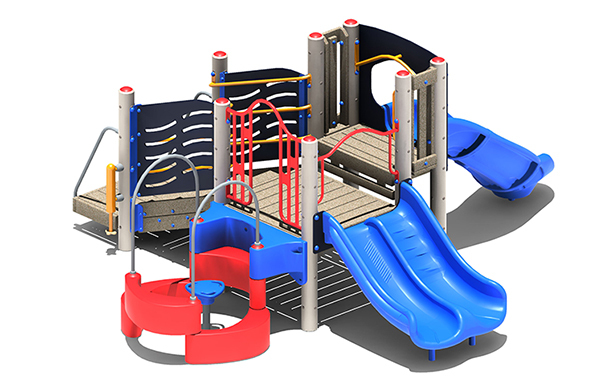 The compact Buckaroo Playground features an ADA compliant transfer platform allowing easy access to the 5 play activities. Use Zone: 28'0" x 30'0"